The Present: In an upscale section of New York City, April, Casey, Leo and Raph are spying on Dr. Miller’s place from April’s van. They see him get in a limo with Karai and suddenly realize that Casey’s gut instinct from before was correct. Inside the limo, Dr. Miller tries to break the ice, but Karai is not in a chatting mood. She spots the van following them and tells the chauffer to lose them. April follows the limo into a tunnel, where the suits in the limo change into Foot Soldier garb and leap onto the roof of her van. 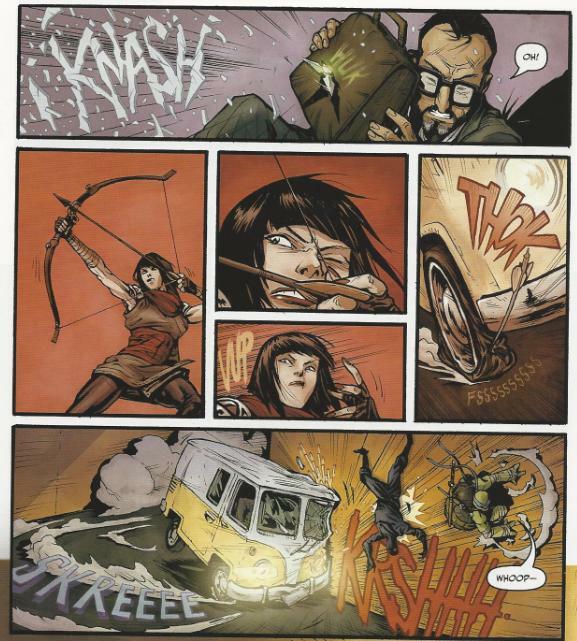 Leo and Raph fend them off, but Karai takes down the van with an arrow to the front tire. Before the limo can disappear, though, Raph nails a tracking shuriken into Dr. Miller’s briefcase through the back window. At a skyscraper, Karai ushers Dr. Miller to an upper level office. He’s met by the Shredder who offers Dr. Miller a substantial sum of money to decrypt his copy of “The Secret of the Foot”. Miller is confused as to who exactly is trying to employ him and the Shredder reveals that they are the legendary Foot Clan. 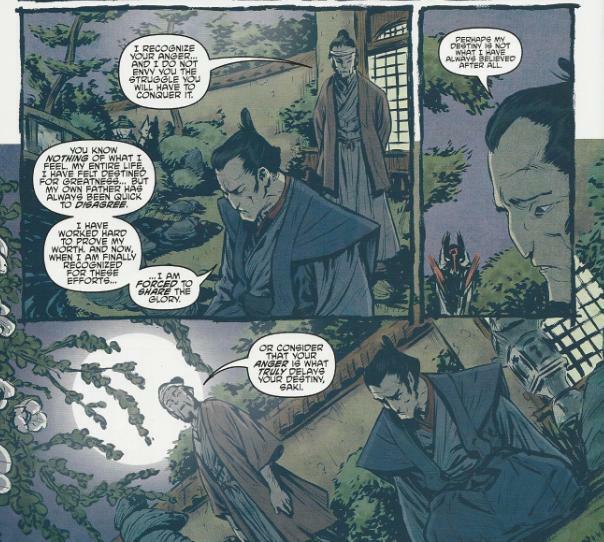 The Past: A monk shows a young Oroku Saki a collection of objects and asks him to pick three. Saki picks three (including a copy of “The Secret of the Foot”) and his father, Oroku Maji, becomes terribly distressed. The monk tells Maji in private that Saki is undoubtedly the reincarnation of Tatsuo Takeshi, the man he assassinated, and Maji fears that the Kitsune witch’s curse has come true. The monk tells Maji that though he may be Tatsuo’s reincarnated spirit, with love and a proper upbringing, Saki may yet grow to be a completely different sort of man. Maji takes comfort in this and finds that despite the circumstances, he loves his son no less than before. Years pass and the Foot Clan are celebrating Hamato Yoshi’s and Oroku Saki’s successful assassination mission. Saki has grown into a vain braggart and womanizer. Saki attempts to flirt with the pregnant Tang Shen, and when she rejects him, he attempts to strike her. Yoshi flips him onto his back before he can land the blow and the embarrassed Saki challenges Yoshi. Master Masato breaks the fight up and orders Saki to comes see him and Maji in private. Saki claims that Yoshi began the confrontation, but Maji tells him to watch his temper and learn greater patience. Master Masato then tells him why he has been brought to a private conference. Masato invites Yoshi into the room and announces that both Saki and Yoshi have been selected to be the Foot’s newest Chunin. Saki is outraged at having to share the honor with Yoshi and storms out. Masato asks Yoshi to try and speak with Saki and hopefully foster a friendship with him. Outside, Yoshi asks Saki what’s on his mind. Saki tells him that he has spent his whole life trying to prove to his father that he is destined for greatness, but Maji has always disagreed with his ambition. Being forced to share such an honor with another comes to him as yet one more slight. Yoshi suggests that perhaps it is his anger that is holding him back, not his father’s disapproval. He then tells Saki that he has also battled inner demons of that nature and recommends he attempt to find peace through meditation. Later, Saki’s meditation is interrupted by the Kitsune witch. She tells Saki that he will learn of his legacy in something hidden beneath the floorboards. Saki searches the floor and eventually finds a hidden compartment containing something. The Present: Donatello, Michelangelo and Splinter arrive in the tunnel and help fix up April’s van. Raph compliments Don on his tracking shuriken (while ribbing him on his “duzmachines” internet handle) and now, with the gang all together, Splinter suggests they venture to the source of the signal. While the Turtles and Splinter scale the outside of the building, Casey and April infiltrate through the elevator with the mission of getting Dr. Miller (whom they assume has been kidnapped) to safety. As the elevator opens on the upper floor, the Turtles and Splinter have already begun battling the Foot Soldiers. Inside the office, Shredder notices the tracking shuriken on Miller’s briefcase and slaps Karai for making such a rookie error. He orders Alopex to guard Dr. Miller while he goes out and deals with the intruders. The Past: Oroku Saki looks at the object hidden beneath the floor and realizes that it is “The Secret of the Foot”. *This story is continued from TMNT: The Secret History ofthe Foot Clan #1. The story continues in TMNT: The Secret History of the Foot Clan #3. *Hamato Yoshi’s anger issues, as well as his assassination mission with Oroku Saki, were chronicled in TMNT Microseries #5: Splinter. *Donatello’s “duzmachines” screen name was first seen in TMNT Microseries #3: Donatello. *This issue was originally published with 3 variant covers: Regular Cover by Santolouco, Cover RI by CP Wilson III and Ryan Browne, and Cover RE Jetpack Exclusive by Kevin Eastman and Ian Herring. When it comes to IDW’s TMNT comics, I don’t want to play favorites. That’s like choosing between my children. However, for everyone underwhelmed or not enjoying the current arc of the ongoing series with all its Fred Wolf influences, then THIS is the TMNT comic you need to be reading. It’s full of ninja and Shredder and sword-clashing action and should more than satisfy anyone whose preference for the Ninja Turtles veers more toward stories involving the Foot and Oroku Saki. IDW’s basically got something for everyone on the table right now, so I really can’t imagine fans anywhere being let down. The best part about this installment was the look at Oroku Saki’s childhood. Since his very first appearance in 1984, the Shredder has had the potential for a layered origin. 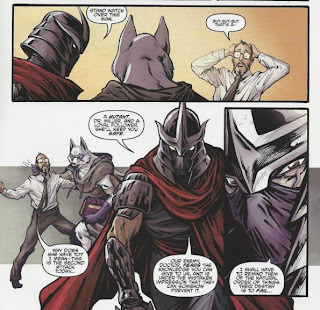 In the Mirage series, it was explicitly stated that the Shredder wanted vengeance for the death of his brother and the Foot used that hatred to warp him into a cruel and vicious adult. Mirage’s Shredder was, for all intents and purposes, a “victim” consumed by the same sense of tragedy, loss and impotent rage as Splinter felt for Hamato Yoshi and Tang Shen. However, due likely to his only being in four issues total, that angle of the Shredder was never explored. At first, IDW wasn’t looking to be digging much deeper into Shredder’s back story. He seemed to be the same kind of merciless psycho that he’s always been. Don’t get me wrong, I’m fine with villains that are evil for evil’s sake; I loved Ch’rell from the 4Kids show and that Shredder had no motivation beyond “I’m evil”. However, adding another dimension to the Shredder’s background couldn’t hurt. Here, we learn that Oroku Saki is a victim of his father’s actions. The reincarnation of Tatsuo Takeshi, he may not have had a choice in how he was going to end up despite his father’s efforts to put him on the right track. Seeing him as a young adult, struggling with those frustrations and lashing out, and much like the Mirage Shredder, being manipulated by sinister forces down a path of evil, you get the impression that it may not be all his fault. And this is AFTER we’ve learned that he eventually has four helpless children executed. I like that kind of stuff, as it challenges the reader and the characters. Splinter has already told the Turtles that there’s no “maybe” when it comes to killing the Shredder; they’re going to have to do it. But I wonder, if Splinter knew of the circumstances behind Oroku Saki’s spiritual conception and the forces that set him down certain paths, would he be able to forgive him for what he did? And is there any sort of hope for the Shredder to yet turn away from all that now that he’s been reincarnated and given a new chance? They’re great concepts to ponder over and it’s nice to have a Shredder worth thinking about for a change. Even his dismissal and abuse of Karai is alarming, as he’s basically perpetuating the cycle of fatherly disappointment that stoked the anger inside him in his youth. He’s turning into precisely the thing that brought him so much bitterness and one has to wonder if he’s even aware of that. Incidentally, I loved the way the monk determines Saki’s past life as Tatsuo. It’s the same process used to determine the reincarnation of the Dalai Lama. Or, for those who watch a lot of Nickelodeon, the same process used to determine the next Avatar. As much as I enjoyed this issue, there were some storytelling shortcuts that kind of stuck out to me. How exactly did Splinter, Don and Mike get to the tunnel without a car? And so quickly? The Turtles and Karai enter the tunnel by smashing through a gate and surprising a guard, yet no authorities ever enter the tunnel to confront April even after she’s been sitting down there for what has to be an hour or more. And how exactly did April and Casey get access to an elevator that takes them to the same floor where Shredder’s having his private meeting with Dr. Miller? Does Foot HQ really have such lax security? Obviously, these were all logical concessions made to keep the story rolling and you’re supposed to just let them slide, but at the very least, April and Casey waltzing into Foot HQ and taking the elevator should have been accounted for. That’s just silly. Santolouco’s art is just so damn gorgeous. In this issue, particularly, I loved his rendering of the upper class New York neighborhood that Dr. Miller came from. The architecture is so perfect, I wonder if he photo-referenced a specific street or drew it from scratch? Because it’s absolutely sells a sincere-looking New York, as opposed to the “outsider’s impression” of New York that a lot of artists put to paper. And so many points for the “fish-eye lens” effect on that last page. It really gave the mayhem of the hallway battle so much extra “oomph”. Vieira’s coloring is also worthy of props, especially during the car chase in the tunnel; the yellow glow and light blurs really set the mood. I love how pasty and pale his April is, too. It’s an effect I’ve never seen any other colorist apply to April, and maybe it gets too “Irish” for some, but I think it looks great. The flatter, simpler coloring for all the Feudal Japan segments gives those sequences a greater sense of contrast without being too on the nose about it (like sepia-toning the whole thing, like a lot of lesser colorists might be tempted to do). It’s an understated effect, but one your eyes pick up on without the effect calling attention to itself. 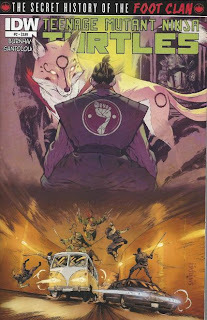 Anyhow, “Secret History” might be a tough read for newcomers, as it expects readers to at least be familiar with the previous Feudal Era back story from the ongoing and the Microseries. But even with that in mind, I’d still recommend it as a jumping on point, as it offers plenty of well-rendered action to counter any such storytelling confusion and, hopefully, might inspire new readers to pick up the ongoing and see what they’ve been missing. I also wondered about the post-crash scene. Having enough time for the turtles to get back together and change a tire is a bit much for no police to show up (or EMS for that matter). As for Casey and April getting to the floor that the Foot were on...well, I kind of assumed it wasn't their headquarters as much as maybe just one of many offices they lease around the city. Love your articles, keep up the amazing work!